As a supplement, take one tablet per each alcoholic drink at the time of consumption. Shelf life is two years. RU-21 is not intended to diagnose, treat, cure or prevent any disease. 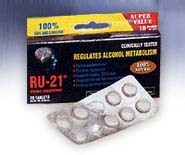 RU-21 is not intended to prevent or treat the effects of excessive alcohol consumption. Exceeding the recommended dosage may not improve results. Not intended for anyone under age 21. If taking medication, consult your physician before using this product.